“The grass you’re standing on, my dear little ones, is made of a new kind of soft, minty sugar that I’ve just invented! I call it swudge! Try a blade! Please do! It’s delectable! Filled with nostalgia from my childhood obsession with the wonderful world of Willy Wonka, I immediately grabbed two bags and tossed it into my basket. From there, it promptly sat on my counter waiting to be used for something scrumdiddlyumptious. This is what I have for you. 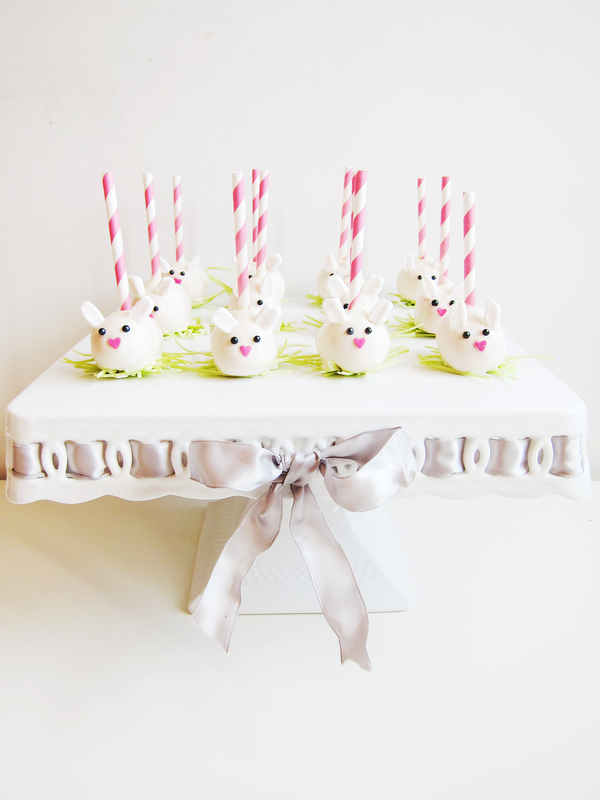 It’s perfect for Easter*, spring and bunny themed parties. I hope you give it a try and wait for the squeals of “It’s so cute!” to follow you for the rest of the day. 1. Crumble up cooled cake until you have very fine cake crumbs. 2. Add half of the frosting to the cake and mix until it is evenly distributed. If you can mold the cake into a firm stable ball at this point, stop. If not, add the rest of the frosting ¼ at a time until you are able to shape it. 3. Scoop tablespoon sized balls of the cake mixture and shape into an oval (approximately the size and shape of a piece of sushi rice ball). a. Cut the mini marshmallows vertically, and dip into sanding sugar for the ears. b. Cut more mini marshmallows horizontally for the tails. c. Cut edible grass into desired size. d. Melt the chocolate wafers in the microwave until completely smooth. 6. 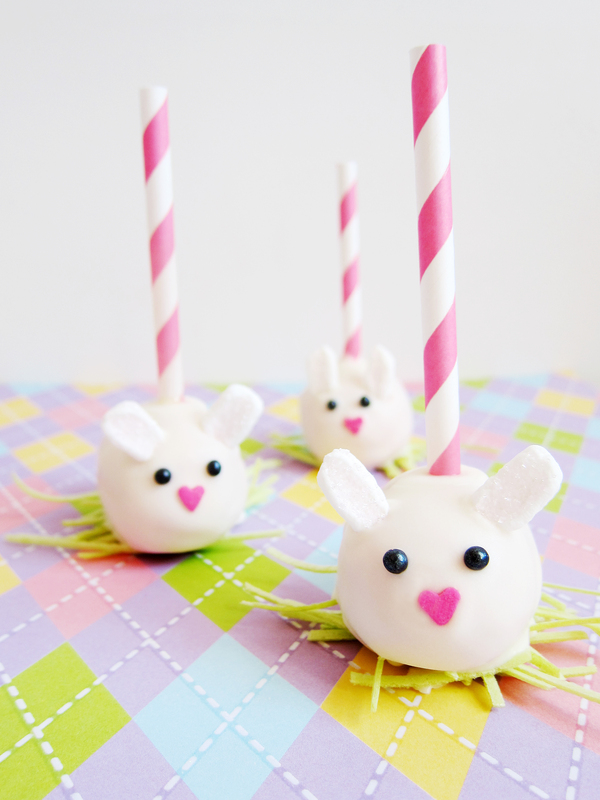 Remove the cake balls from the freezer and dip your stick (or straw) into a little chocolate and insert it into the top middle of the cake ball. Place back into the freezer for 5-10 mins until the chocolate has set. 7. 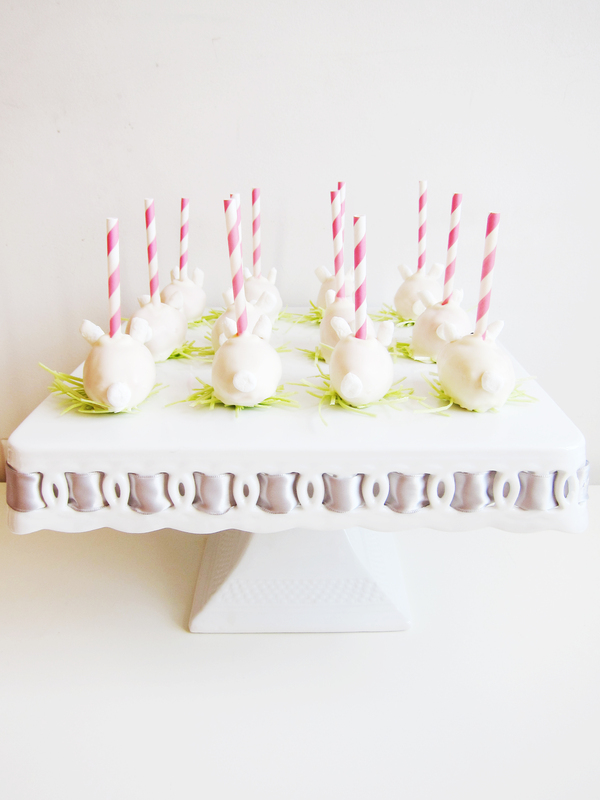 Line a sheet with parchment paper and place tufts of edible grass where your coated cake ball will land. 8. Once the chocolate has set, take the stick and submerge the cake ball into the melted chocolate and gently tap the excess chocolate off. Place on the edible grass. 9. Quickly, before the chocolate sets, place the tail on one end and the ears on the opposite end. Place two black pearls for the eyes and a heart shaped sprinkle for the nose. You can use a (clean) tweezer to facilitate the placement of the eyes and nose. 10. Let the chocolate set at room temp, or if you’re in a hurry you can place it in the freezer to set it. *I am aware that bunnies have nothing to do with the meaning of Easter. **Be careful when chilling the cake balls. If the cake balls are too cold, it will crack your chocolate when it comes to room temperature. This entry was posted in Cake Pops, Desserts, Holidays and tagged Cake Pops, Desserts, Holidays. Bookmark the permalink.